A passion for helping others improve and maintain financial achievement is what led Aaron Gordon to Watermark Wealth Strategies. As an advisor at our firm, he has the privilege of joining individuals and families on their road to financial independence by way of all-encompassing, tailored strategies. His talent for public speaking has made a natural liaison within the community, allowing him to begin long lasting relationships by educating prospective clients on the importance of planning for the retirement they’ve always dreamt about. Aaron’s disciplined approach to wealth management was instilled in him during his tenure in the U.S. Navy. 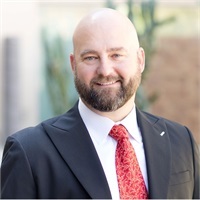 Following four years of service, he entered college at Arizona State University, earning a Bachelor’s Degree in Finance. Upon graduation, Aaron accepted a position with New England Financial, where he honed his expertise for 16 years. Among his many accolades are awards such as the “Captain’s Pennant”, “Top Disability Advisor”, perennial “Leaders Conference Qualifier”, and “Associate of the Year”. Today, Aaron has expanded his services by working with clients who are looking to accumulate multigenerational wealth, reduce taxes, maximize their plans, and balance risk. He’s not only a valuable asset to our team, he’s also a respected leader in the areas of estate planning and money management. When away from the office, Aaron and his wife, Sara, are busy raising four children, Hunter, Aubrie, Ava, and Sophia. His hobbies range from playing guitar and attending sporting events to competing in triathlons and marathons. For the past eight years, Aaron has also been a devoted volunteer at Arc of Tempe, an organization which enhances the lives of those with intellectual and developmental disabilities.